Other Ugly Tacky Holiday Sweaters - Lots of designs to pick from! Fans of popular movies, television shows and other fan favorites will find a treasure trove of Ugly Christmas Sweaters for gifts. 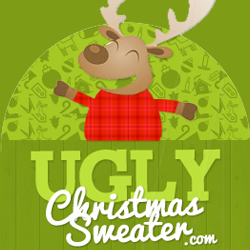 You will love the Disney character sweaters, Star Wars sweaters and even men’s suits in the tacky Christmas sweater style. In addition, find gifts for everyone including sweaters for dogs, motorcycle sweaters and really tacky sweaters that light up for your party.